Built in 2008, The Radiance is home to 99 residences at 325 China Basin Street & 330 Mission Bay Blvd. North in the Mission Bay neighborhood of San Francisco. Home sizes at The Radiance SF average about 1,000 square feet with some homes offering up to 1,800 square feet. Homes are available in one-bedroom and two-bedroom layouts. Building amenities include attended lobbies, lushly landscaped 8,000+ square foot rooftop courtyard with fire-pit and barbecue area, fitness center, club lounge, individual storage, professional management, and closed-circuit cameras provide 24-hour security. Developer/Builder: Bosa Development Corporation | Architect: Perkins & Co. The Radiance SF at Mission Bay is a mid-size building that offers waterfront living in the heart of the Mission Bay neighborhood. The first Bosa development in San Francisco, it features 99 homes in two nine-story mid-rise buildings. Almost all of the homes have private outdoor space. 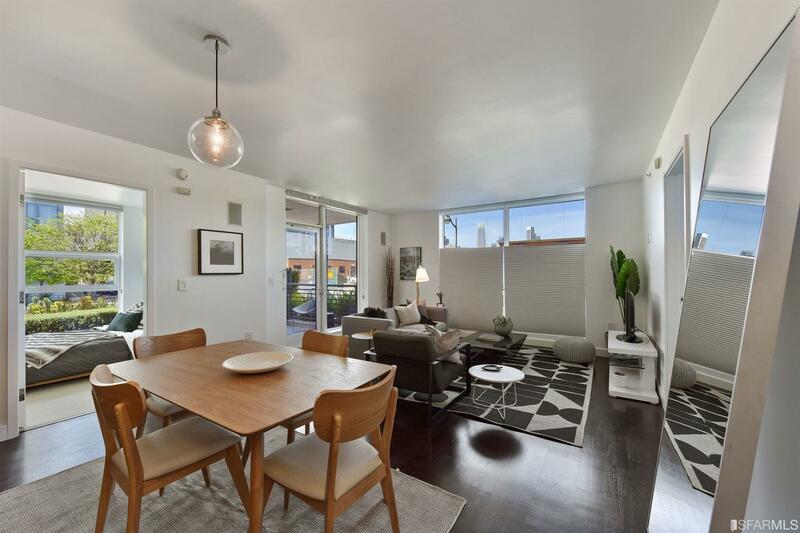 The centerpiece of the building is the large rooftop courtyard that faces the San Francisco Bay and provides a wonderful space for residents to relax and enjoy the sights and sounds of the Mission Bay neighborhood. Floor plans are spacious, with one bedroom homes averaging about 1,000 square feet and two bedroom homes in the 1,200 – 1,400 square foot range, while some homes with an additional den offer about 1,800 square feet of living space. As originally built and sold by the developer, the interiors featured hardwood flooring, full-height windows, solid core doors, and a full-size stacked washer/dryer. Kitchens at The Radiance were originally built with European-style wood veneer cabinetry, Caesarstone countertops, and KitchenAid stainless steel appliances, including gas cooktops. The Radiance is directly to the east of The Madrone, another Bosa development. The buildings share many architectural details in common, but are separate legal entities and do not have reciprocal access to HOA facilities. The homes along the south side of The Radiance face the Mission Bay Commons Park, just one small part of the 49 acres of open space in the Mission Bay neighborhood. Self-parking, most homes have one parking spot. Part of the Mission Bay master development plan, no BMR homes in the development.